Wings Air Charter LLC offers air charters from the central Wisconsin area to destinations of your choice, and more importantly, on your schedule. Whether your company needs to transport people or packages, Wings provides quality air charter service at affordable rates. Wings is a FAA licensed aircraft charter service offering a Twin Engine Cessna aircraft. 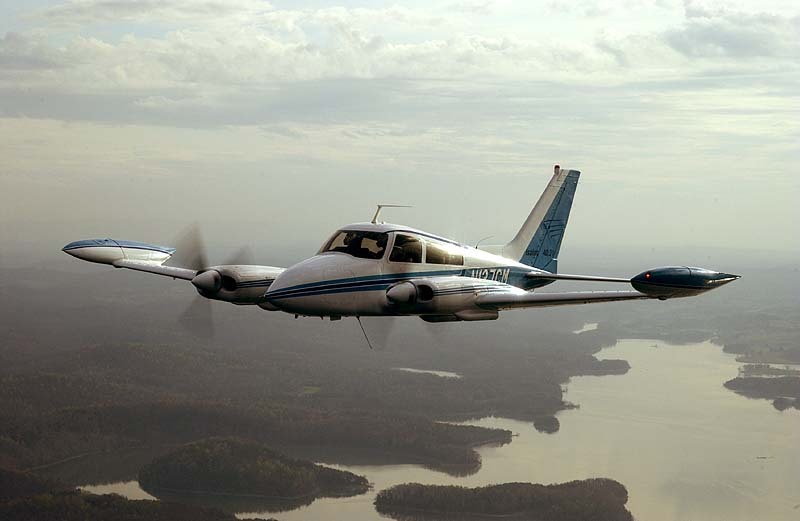 Our Cessna 310R is a 200 mph five passenger aircraft. Why Charter? No need to arrive one hour early for your flight. No time consuming connections. You fly direct from your closest airport to the airport closest to your meeting. Additional passengers fly at no extra cost. Save overnight expenses by getting all your work done in one day. Depending on the trip, we often beat the airline prices. Do you need to fly frequently? Save even more money as a fractional owner of an aircraft. Click for details. Travel to downtown airports closest to your meeting. Luggage always arrives with you. Hold meeting with key staff while en route. 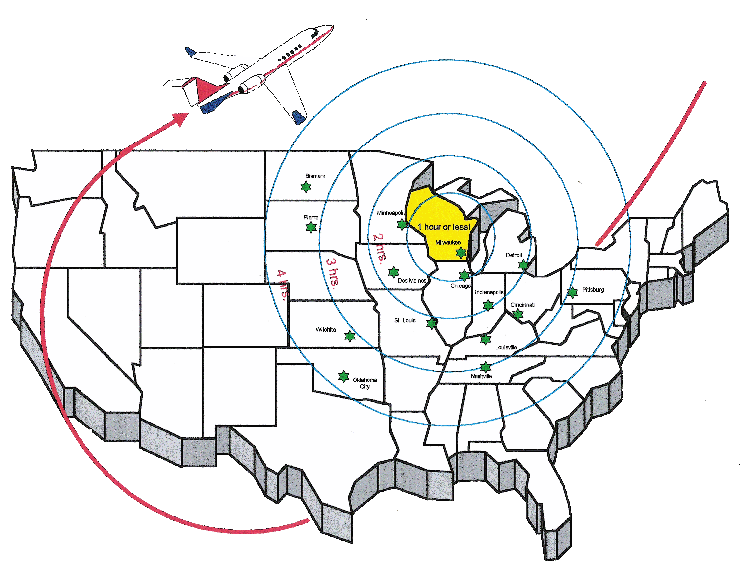 We serve all U.S. airports and have frequent flights from; Wisconsin Rapids (KISW), Stevens Point (KSTE), Central Wisconsin Airport (KCWA), Wausau (KAUW), Marshfield (KMFI), Merrill (KRRL), Rhinelander (KRHI), Medford (KMDZ), Eau Claire (KEAU), Appleton (KATW), Green Bay (KGRB), LaCrosse (KLSE), Madison (KMSN, and Milwaukee (KMKE & KMWC). Here are some of the benefits we can offer you. Wings offers the safety, comfort, and speed of twin engine aircraft! Wings serves thousands of destinations within the 48 contiguous United States that are not available with the major airlines. You choose your departure and return times. If a meeting runs late you will have the peace of mind knowing that your flight runs on your schedule. Short notice trips are not a problem for Wings. No need to scramble trying to find those "super saver" deals. Short notice flights are the same price at Wings. Many trips that would take two days on the airlines can be completed in one day with Wings. Save with no overnight expenses. Every Wings flight is personalized to meet your needs. No more lengthy layovers in busy airports. We maximize your time. Do you fly frequently? 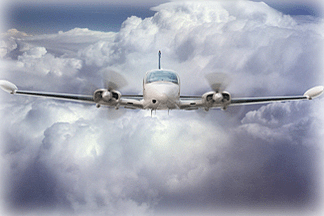 Own a 1/8 share of a Cessna 310. Save 30% to 40% when compared to charter. Please call us at 715-424-3737 for a custom price quote to a specific city that is not listed. The rate is the same regardless of the number of passengers. Up to 5 passengers can travel for the same price. Prices are subject to change without notice. *WINGS AIR CHARTER LLC is a FAA licensed Part 135 Air Carrier.